Firefighter Josh Ward located the dog inside the house, pulled the pet to safety and reunited the dog with the worried owners. Thanks to a Dacula, Ga., resident, who called the fire department, a small dog trapped inside a burning home was saved. The hero firefighters arrived with enough time to fight the flames and rescue the pet. Firefighter Josh Ward rescuing the trapped dog. Photo Credit: Gwinnett County Fire Department. On Nov. 13, 2014, the concerned citizen was walking down Mitford Lane when he spotted smoke coming out of the home’s garage. Immediately, the community member contacted Gwinnett County firefighters and alerted the home’s residents, who were outside, about the fire. According to Capt. Tommy Rutledge, Gwinnett County Fire and Emergency Services Public Information Officer, when the rescue team arrived on the property, the flames had spread to the second floor. Firefighters quickly fought the flames and were able to enter the home to rescue the trapped dog. Luckily, the dog suffered no injuries. Authorities are still trying to determine the cause of the fire. 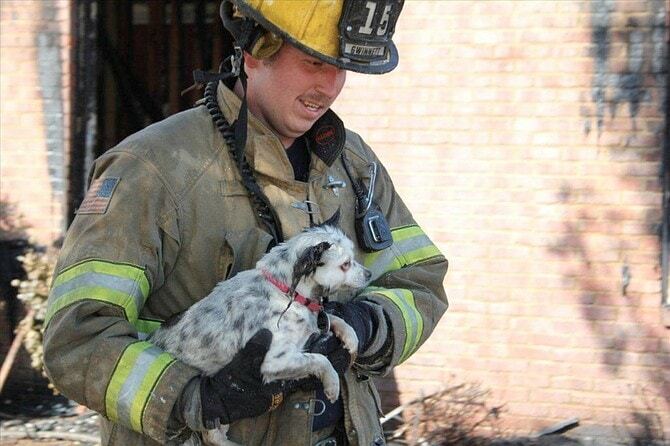 Thank you to the firefighters for your courage and dedication to saving lives, including the lives of pets. Love men who love animals- all others can get out of my way! God bless this man. A true hero. God bless this baby. Fire men are true heroes. Hey Chief! Claim your free Gems up to 2500 for your Clash of Clans!!!!! 🙂 http://facebook.com/391188974370650? Thank you for s saving the little dog… God bless you.